The Blackhawks lost Duncan Keith early on Saturday night to a game misconduct penalty and were reminded late how bad they need him. 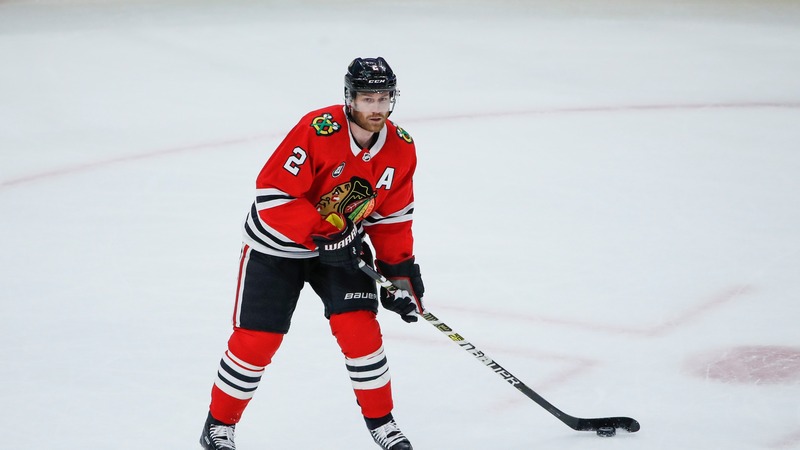 The Chicago Blackhawks have made it clear with their actions over the course of the last 13 years that they value defenseman Duncan Keith. And just in case they had forgotten how important he still is to their success, they got a reminder on Saturday night against the Calgary Flames. Jonathan Toews and Patrick Kane might be the forward faces of the franchise, but Keith's gap-toothed smile underpins all the success that they've had. Not everything he does for them earns notice, but when he's gone for whatever reason his true value becomes clear. On Saturday in Calgary, the reason was a boarding call early in the first period. Keith checked Flames center Dillon Dube from behind and Dube went head first into the boards. Keith surely committed a penalty, but the intent wasn't to injure. That was evidenced by how quickly he went down to Dube to check on him as soon as he realized he was hurt. However, the resulting injury made the refs feel like they had no choice but to punish Keith for the play. They gave him a game misconduct and a Blackhawks defense that has already struggled this season was forced to play a young, fast team without their best player. The five defensemen that were left battled to keep the Flames out of scoring areas and Corey Crawford sucked up shot after shot for two periods to keep the Blackhawks out in front. However, when possession dried up in the third period, it put more pressure on the Blackhawks blue line than it could bear. A 20-shot third-period onslaught by the Flames yielded three goals and sent the Blackhawks back home as losers of five straight. Now, they've got to hope that the league office sees Keith's hit as unfortunate but incidental and doesn't decide to punish him any further. Because it became clear on Saturday that the Blackhawks are going to have their problems exacerbated if they're faced with playing without him. Of course, the Blackhawks knew that already. They didn't need the hand to go up and for Keith to be sent off to be reminded of it. But reminded they were. The silver lining here is that, barring suspension, Keith will be back. And his long-time buddy on the blue line, Brent Seabrook, was extremely solid in nearly 27 minutes of ice time without him. The Blackhawks are going to need that if they're going to correct some of their defensive issues moving forward so that tape should be valuable for Seabrook. However, not much else good can come from losing arguably your most important player just minutes into the game.